Despite the blustery weather, a small crowd gathered for the October 9th dedication of the Sand Coulee Scientific and Natural Area. October 9th was a cold and blustery day. 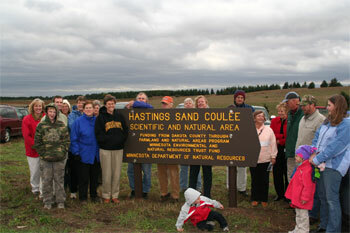 This did not deter two dozen people from celebrating the new Hastings Sand Coulee Scientific and Natural Area (SNA). This newest unit of the SNA program was established to protect the high quality prairie that is found on the site. The Sand Coulee, located near the city of Hastings, is the largest prairie remnant in Dakota County. This dry sand/gravel prairie is home to a number of rare species, whose future in the area is tied to the health of this prairie. Two of the rare plants that live in the coulee are James polanisia, which has been located in only four other sites in Minnesota, and narrow-leaved pinweed, which is known to occur in only one other place in the state. Rare animals include several species of butterflies and snakes. 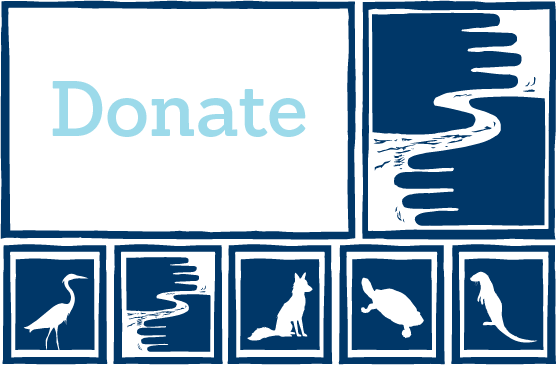 FMR has been leading the effort to protect and restore the prairie in the Sand Coulee since 2001, when we began to reach out to those who own the land in the area. Since that time, Karen Schik, FMRs ecologist and project manager, has developed natural resource management plans for most of the coulee and is leading the restoration and management activities. Several years ago, during a site visit to a portion of the coulee that was owned by the Maher family, FMR staff were approached about purchasing the prairie portion of the property. Taking this invitation seriously, we put together a partnership which included the Department of Natural Resources and the Dakota County Farmland and Natural Areas Program. This work culminated in the permanent protection of the 76-acre parcel. FMRs involvement in this project will not end now that the property is protected. We will assist the DNR is managing and restoring the Sand Coulee SNA. Many trees need to be removed and fire will be reintroduced to the site. Well keep you updated. We would like to thank the Maher family for their long-term stewardship of this prairie and their willingness to sell it for conservation purposes. Thanks also to the Dakota County Farmland and Natural Area Program and the SNA Program within the DNR, especially Lee Markell.